I've been reading a lot of thrillers lately so I'm not sure I loved this book as much as I would have had I read it at a different time but I did still really enjoy it. I am back with another book review, Her One Mistake by Heidi Perks. Thanks so much for Simon and Schuster Canada for sending me a copy of this book as part of the Thriller Chronicles for an honest review, as always, all opinions are my own. Without giving away too much, this book follows Charlotte, a mother of three kids who, after much convincing, takes her children and her best friend, Harriet's daughter, Alice, to the school fair. When Charlotte and her children return home safely - but four-year-old Alice disappears - fingers start to get pointed. Charlotte only looked away for a second, this cannot possibly be her fault. Harriet and her husband Brian are devastated when they find out their daughter is missing and refuse to speak to Charlotte. 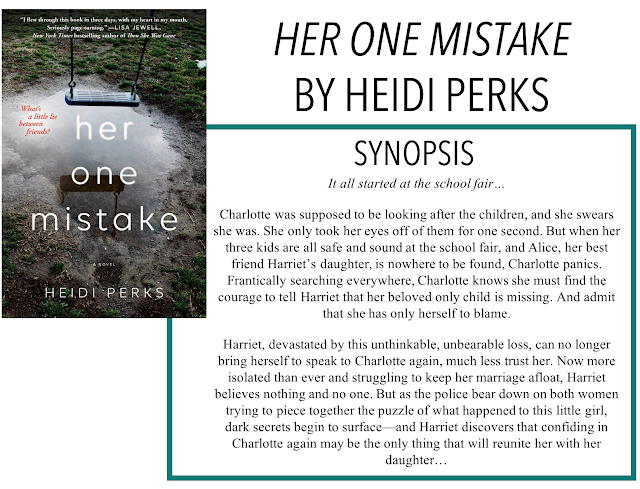 As the investigation progresses, however, Harriet realizes that the only way to get her daughter back is to confide in Charlotte - if it's not already too late. This book definitely started off a little bit slow - again, that might just be because I've been reading so many great thrillers. We open with Charlotte being questioned by the police and then jump back almost two weeks to the initial incident. The book itself is broken into two halves, Charlotte's story and Harriet's story. Once we get to Harriet's story, things really started to pick up and I was fully invested in the story. The book focused less on the mystery of finding Alice and more on the dynamic between Charlotte and Harriet and Harriet and her husband, Brian. Right off the bat, there was something that rubbed me the wrong way about Brian. I don't really think this is a spoiler but he spends a lot of the book trying to convince Harriet that she's forgotten things or that she's going crazy. Honestly, this is one of my biggest fears and for a good chunk of the book, my heart was in my throat as he constantly gaslighted her. When it's finally revealed what happened to Alice, I was shocked. It makes sense after finishing the book but, at the time, I had no idea why things played out the way they did. I won't spoil anything but I will say this - that did not go the way I thought it was going to. I can't quite put my finger on it but there's just something - off - about this book that's making me give it a lower star rating. It's definitely not a bad book and I did really enjoy it, I just felt like once we knew what was happening, everything unfolded a little too perfectly. Overall, I would definitely recommend this book - especially if you liked The Couple Next Door by Shari Lapena - there are some similarities here.